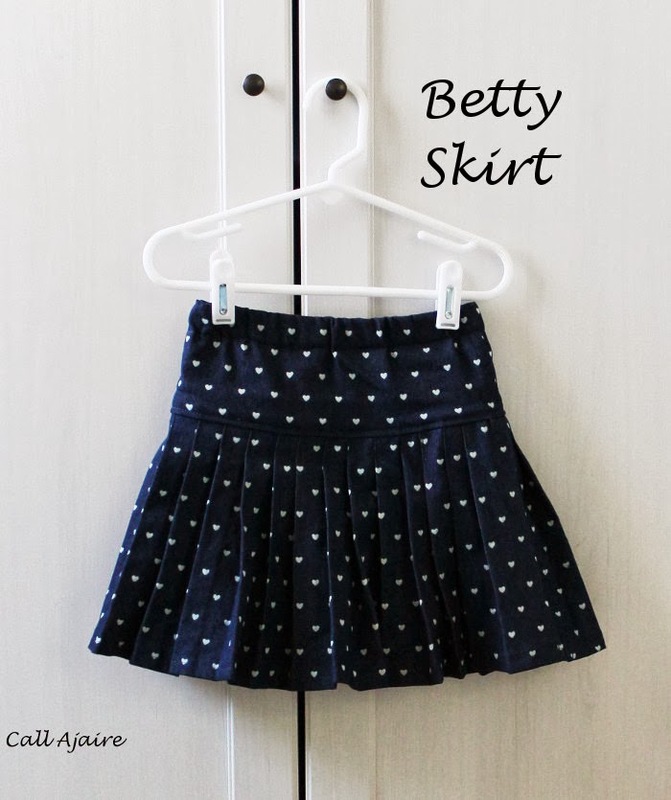 I’m so excited to tell you about the Shaffer Sisters’ first e-book pattern release: the Betty Skirt! These lovely ladies are always creating great clothing for their own children and now they have banded together, combining their individual skills as only sisters can to make an e-book worth of options for a yoked skirt. The basic design is inspired on the deep yokes of the 1920’s. I was a pattern tester and made the version with the small pleats. 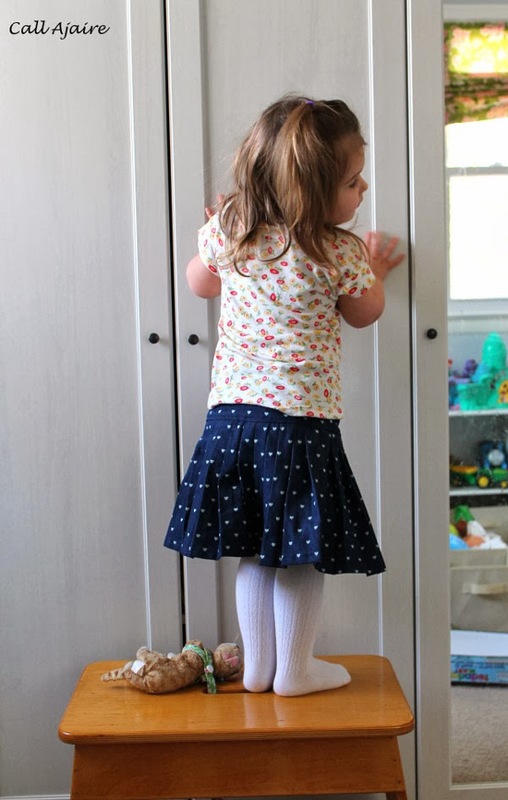 There are three other skirt options in the e-book along with instructions on how to get a perfect fit using your child’s measurements. Bean’s 3T size skirt was made late one evening. I decided I’d start the skirt even though it was late, but then it was finished before I thought it necessary to stop. The shape of the pieces make the construction and cutting out super simple. The pleating was the most difficult part and even that was a snap. Of course getting her to stand still for a photo is still another story. 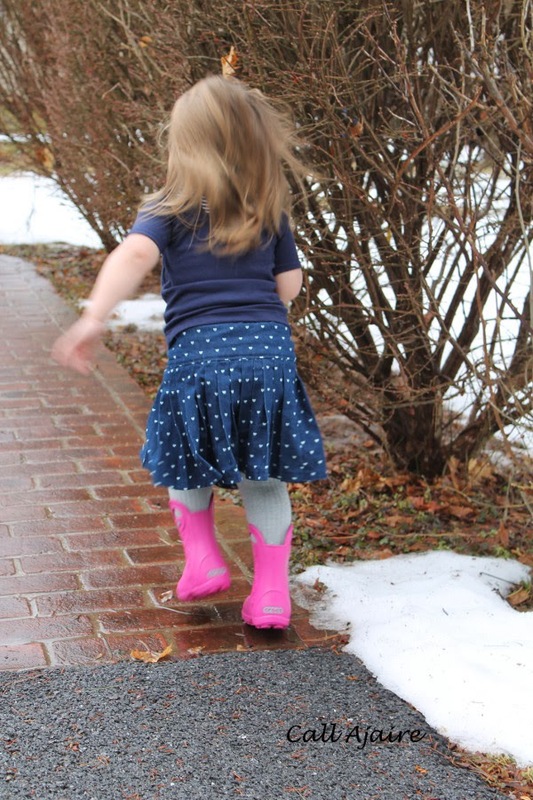 She’s worn this skirt already a few times and I love the length on her right now. I really think you’ll love this e-book. Congratulations to the Shaffer Sisters on a great first release! I wishi had more of this fabric, it's great with everything! Congrats again on pr&p, I know your head is just spinning! When does it start? I like that style even for myself. I remember a skirt I had that I wore until it fell apart and it had that same yoked look to it. I got it at the snazzy store called Weathervane. Does anyone remember that? I thought that was high living when I was in high school!!! Love the length on her. Haha I can't believe you brought up the weathervane. I swear I did so much shopping there 🙂 And I think your skirt might have had more of an angled yoke didn't it? Maybe that was another one. I do think that's back in style now though. yeah, it was probably more of a U shape. Then only thing I've ever put on layaway was at the Weathervane. It was an extremely hot leather and denim jacket. Acid washed denim. I should write a post about it, it was that awesome. I put it on layaway and dutifully paid every week until I had it bought. It was just hideous. But I loved it for like a week. I loved that jacket too. For much longer than I should have haha. I was just going to order the Kitschy Coo pattern – now I'm hoping to win it! Thanks Steff! They are amazing patterns right? Good luck Janice! Whether you win it or buy it I know you'll love it! Wooo hooo!! Thank you for the giveaway!! 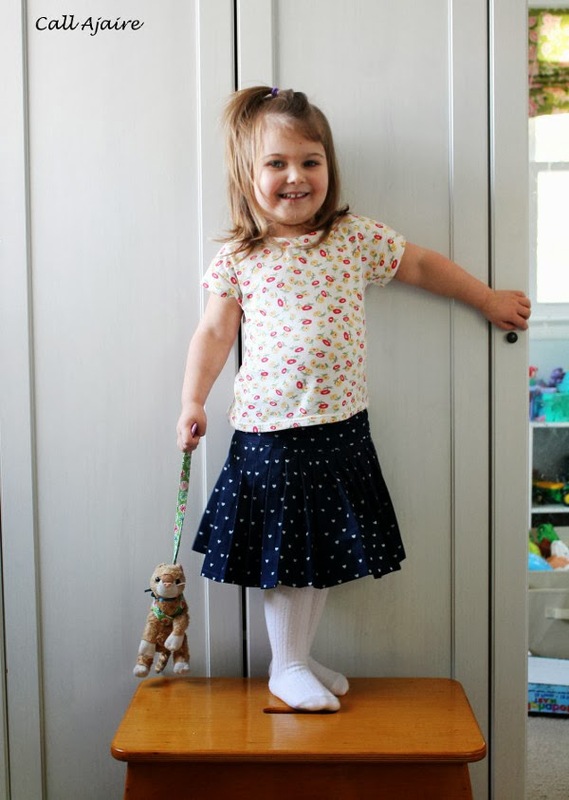 Oh my, this little dress is too cute…….almost as cute as your precious baby Bean! Very cool! I'm still a little afraid of mashups but you make it look so easy! Great job on the mash up! Super cute! I love all the pleats. Got to do one for my little girl, great little pattern! Also, congrats on PRP!! So exciting! This series is awesome and I want to join in! This is really cute! I've not seen this series before, but I'm definitely following it now! Nice work! 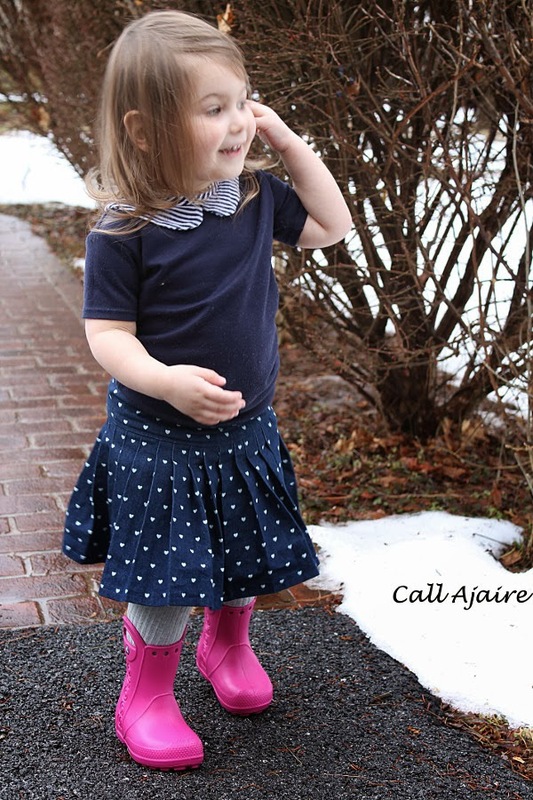 I love the fabric used, very cute for a little lady! My girls would love this, thanks. This sounds like a fun series! I've been interested in trying mashups but not sure how to go about it.. This is SO pretty! I love the dainty floral on the inside too!!! So beautifully done. This is so beautiful, one of these pieces I would like to have for myself… hehehe… your kid just keeps getting cutter too.